L-Tryptophan is an all-natural dietary supplement commonly used to counter insomnia, as well as depression, anxiety and premenstrual syndrome. The active ingredient, tryptophan is found in many everyday dietary sources and has long been associated with sleep induction. How does tryptophan work to promote better sleep quality? Tryptophan is an amino acid that interacts with those brain chemicals important to sleep and the timing of your biological clock’s sleep-wake cycle. 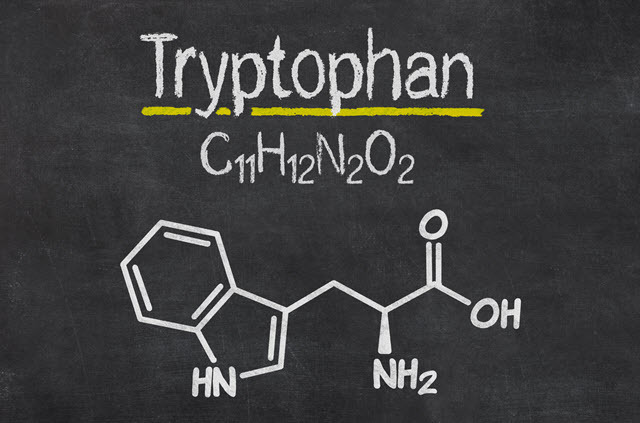 Tryptophan increases serotonin, which also increases melatonin, both neuro-transmitters in your brain’s pineal gland. These neural “gateways” regulate sleep and mood chemicals that affect sleep and mood balance. When either serotonin or melatonin is disrupted you can suffer insomnia and depression symptoms. Tryptophan supplements provide extra doses of sleep inducing amino acids that reportedly help counter sleep disturbances. Since most Thanksgiving dinners throw people into sleep comas the standing myth is that turkey is loaded with tryptophan. But turkey’s tryptophan is likely NOT the primary culprit for this annual post-feast symptom as much as is general overeating. Discontinue use if you experience any adverse side effects. For the most part people use l-tryptophan supplements safely and effectively to manage temporary insomnia and sleep disturbances. But if you are facing chronic insomnia, it ‘s best to see your doctor. There are non-pharmacological medical solutions available outside the natural supplements. If you do any reading on l-tryptophan you’ll likely turn up more than a few references to its safety most of them stemming from one particular episode. In 1989 an illness, called eosiniphilia-myalgia syndrome, was blamed on l-tryptophan supplements from a Japanese manufacturer. However, the conclusion was that it was not the tryptophan, but other contaminated ingredients in the supplements that caused this deadly outbreak. For this reason you are cautioned against buying l-tryptophan from foreign sources as cheap and easy to get as they may be. Outside the U.S. the manufacture of natural supplements and herbal remedies is largely unregulated and therefore, unsafe.